PRANKED!!! You got so pranked! Lifetime brings us an amazing tale of pranking gone wrong, internet danger, guy who goes nuts, and teen girls stuffed in trunks! The Bride He Bought Online is pure, concentrated Lifetime amazement that raises the bar for their original movies. It’s not really that much of a surprise, for not only is this a Lifetime movies superstar writer Christine Conradt script, she also directs it! Conradt clearly knew she had to up her game, and blasted past that goal and then some! We can only hope this is the beginning of a new level of awesome flicks! How dare you have a basic sense of human decency, what’s wrong with you??? It’s high school, and our trio of main girls are concerned with what everyone in high school is concerned with, views on their secret pranking website! Wait, huh? We’ve entered the world of internet prank videos, a genre that has flourished on YouTube despite the fact most of them are terrible and/or totally fake. But, sure, whatever you want to watch is your business, TarsTarkas.NET can’t really judge based on some of the films we’ve reviewed! 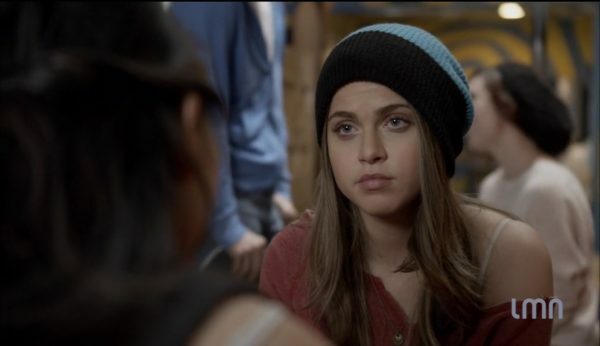 Avery Lindstrom (Anne Winters) is the nice girl who is so done with pranking and is thinking about her future, she also serves as a bookend narrator. Mandy Kim (Lauren Gaw) once was overweight and unpopular, but is now part of the cool squad and desperately wants to stay there. She is starting to have some moral objections to the non-stop pranks, but let’s Kaley push her around. Kaley Mack (Annalisa Cochrane) is attractive, popular, and is the driving force behind the secret prank website. She’s the reason the other two are popular at school, and schemes up the latest and greatest pranks in her quest for social media love. The Bride He Bought Online brings killer internet pranks to Lifetime! Teenagers and the internet are like gasoline and matches in the hands of Lifetime! With The Bride He Bought Online, teen girls pranking a guy into thinking he bought a woman turns tragic when the man turns out to be crazy. I know, disturbed people on the internet? What fiction! But is is real enough for our trio of heroines, who aren’t that nice either, so who are we rooting for? Blood and death, that’s who! The Bride He Bought Online is the directorial debut of Lifetime Channel superstar Christine Conradt, who has written around forty of the channel’s most ridiculous movies, including most of the “_____ at 17” films and the “____________ He/She Met Online” movies. Conradt knows how to deliver a good script full of crazy scenes, and her connections have probably allowed her to be on set for many of these films. So I think things are in good hands, and I hope this is the beginning of a whole new slew of Christine Conradt Lifetime mania! Driven by the growing popularity of a prank blog they’ve created, three teen girls decide to play a ‘catfishing’ joke. They create a fake profile of a beautiful woman on an international mail order bride site, and then wait to see which “pathetic losers” fall for her. One does– a lonely, unstable computer programmer named John. After weeks of being led on, John buys the fictitious woman a plane ticket to come visit him in the U.S. The girls show up at the airport to film his devastation, but when his bride doesn’t show, something snaps in John. The teens have no clue that the man they duped is deeply disturbed and will plan an inconceivable revenge that they will be lucky to survive. Teens, a crazy guy, the Internet coming to kill you, midriffs, Baywatch alums, kidnappings, and follower count obsessions mean this Lifetime flick looks tops! The Bride He Bought Online stars Anne Winters, Travis Hammer, Lauren Gaw, Annalisa Cochrane, Alexandra Paul, and Jamie Luner. It is written and directed by Christine Conradt. The Bride He Bought Online premieres Saturday, July 18th on Lifetime!